Ten world leading masters choose 100 contemporary chefs: Simple concept, yes - simple recipes, no. 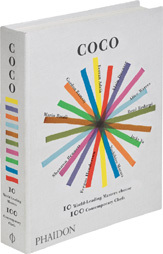 COCO is not your standard cookbook written with explicit details made approachable for the home chef, but rather an exhaustive look at the trendsetters and luminaries in modern gastronomy and what makes them tick. Profiles of 100 up-and-coming chefs, as selected by ten master chefs: Ferran Adria, Mario Batali, Rene Redzepi, Alice Waters, Jacky Yu, Gordon Ramsay, Fergus Henderson, Shannon Bennett, Alain Ducasse, and Yoshihiro Murata are highlighted by beautiful photography of the chefs at work and their cuisine, along with representative menus of their restaurants and adjoining recipes. Over 500 recipes are included, drawn from around the globe, leading to perspectives and approaches one might not encounter ordinarily. The professional chef will find this book as a great source of inspiration and an enjoyable read. While daunting in size (448 pages), the coffee table volume can be read more like a yearbook than a cookbook. Each profile is presented in a distinct manner, so an organized read from cover to cover is not required.